Detectives are questioning a Peoples Democratic Party (PDP) chief on how crude oil proceeds were used to buy choice vehicles for party big wigs. Prince Uche Secondus is being detained by the Economic and Financial Crimes Commission (EFCC) for allegedly receiving 23 choice vehicles from a business associate of ex-Minister of Petroleum Resources Mrs. Diezani Alison-Madueke. 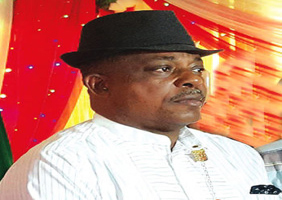 Secondus, PDP Deputy National Chairman, has been grilled for about eight hours on the curious gifts. The detention of Secondus has created panic in the PDP because some leaders of the party were allocated some of the luxury vehicles. Secondus was arrested early yesterday and taken to the EFCC’s Abuja headquarters for questioning. The funds used for the purchase of the vehicles were sourced from crude oil receipts, which the associate did not remit. The unnamed businessman has been in detention in the last three weeks. A source said: “We have detained Secondus to assist the EFCC in its ongoing investigation of how oil receipts were diverted to the purchase of 23 vehicles. “A business associate of ex-Minister of Petroleum Resources, who operates a private upstream oil and gas company, confirmed that the accruable revenue was used to buy the said vehicles. “Our operatives stumbled on these records in the course of going through the Strategic Alliance Agreements (SAAs) with the Nigerian Petroleum Development Company (NPDC). Responding to a question, the source said preliminary investigation confirmed that revenue from oil was used for campaign purposes by the PDP. “This is not the first time that oil cash has been diverted to campaign activities in 2015. Some indigenous oil companies were directed to finance PDP’s campaign. The PDP Deputy National Chairman is also being quizzed over the N10 billion given to PDP delegates to the National Convention that picked former President Goodluck Jonathan as party candidate. “The N10billion constitutes two tranches of N5.08billion each debited to the CBN/OAGF SIGNATURE BONUS ACCOUNT NO 400225220 vide OAGF memo Ref: FD/LP2015/1/28 DF to the Office of the National Security Adviser A/C Number 20172241019 with the CBN Abuja and the second was for credit into the account of National Security Adviser Account Number 1014199287 with Zenith Bank Plc Wuse II Abuja. “The transactions were consummated on November 10, 2014. The mandate that authorised the withdrawal of USD47.0m was from the Office of the National Security Adviser(ONSA) with REF: NSA/366/S dated November 26, 2014. The mandate was processed for dollar cash payment to Mr. S. A. Salisu on November 27, 2014. “The USD5.0m was via a memo from the ONSA memo REF: ACCT/86/VOL. 2/ 218 dated November 13, 2014. The National Security Adviser Account Number 20172241019 was debited and Dollar cash payment made to Mr. Wambai Ibrahim on November 14, 2014 in line with the mandate. Secondus’s arrest has created panic in the PDP because some leaders of the party benefited from the vehicles bazaar. A party leader said: “Actually, some of our leaders were given some of these vehicles but we did not know that oil revenue was used to buy them. And you know, Secondus was the acting National Chairman of PDP during the elections. In a statement last night by its National Legal Adviser Victor Kwon, the PDP lamented Secondus’ arrest. ”The Peoples Democratic Party (PDP) laments the oppressive and unfair treatments against its key leaders by the Federal Government. ”The party alerts the nation that the arrest and detention of its Deputy National Chairman, Prince Uche Secondus, by the Economic and Financial Crimes Commission (EFCC) is part of the grand script by the APC-led Federal Government to decimate the opposition. ”We are also aware that plans have been perfected by the Federal Government to arrest and detain the Deputy Senate President, Senator Ike Ekweremadu, Senate Minority Leader, Senator Godswill Akpabio and other leaders of the party on imaginary charges. ”Indeed, intelligence available to the party shows that the Federal Government, using its various agencies, is bent on destroying any opposition to the ruling party as all indications show that the government is more interested in humiliating the PDP than fighting corruption.